"BAE Systems operates (6) ex-Israeli Air Force A-4N aircraft in Wittmund, Germany. These aircraft fly tow banner, Ground Control Intercept and Close Air Support training missions in support of NATO in Europe." There even more explanation on the decals sheet. The sheet contains markings for four white painted planes with numbers N431FS, N432FS, N434FS and N437FS. Markings are included to allow the making of two planes that look great in all white and their colorful markings. The remaining two planes that BAE also operates are camouflaged. The first is in Israeli colors with a ghost gray bottom and three-color top camouflage, while the last is in overall light ghost gray. All the markings for these are also included. So you can choose one white bird and one camouflage if you like, or mix and match anyway you like for a total of two airframes. The decals sheets are fantastic, printed by Microscale with perfect registration, and nice glossy decals. 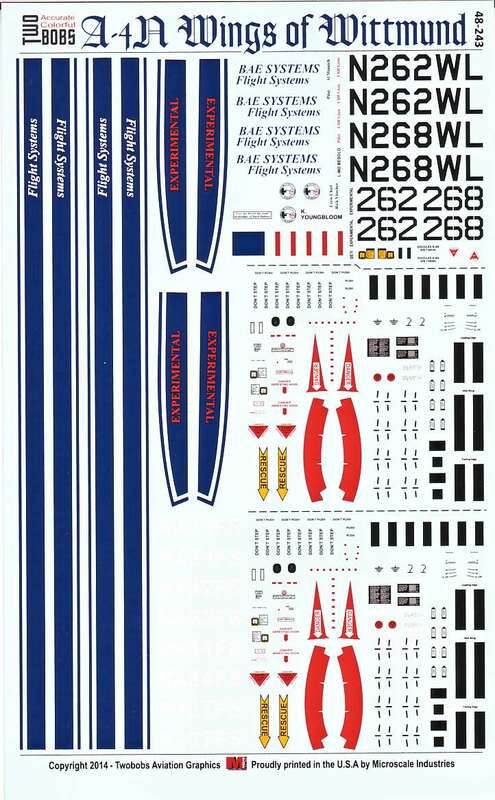 Markings are also included for two wing tanks, which is the standard fitment for these aircraft. 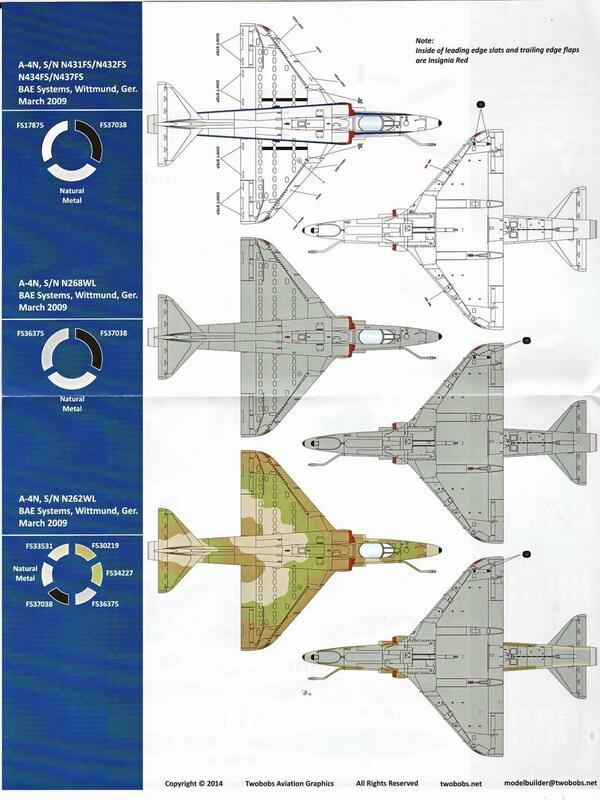 Also included are two sheets with four full color sides, which have left and right profiles of all six aircraft. There are top and bottom shots of all three paint schemes. Each profile includes color call outs by FS number (THANK YOU) and a box showing the correct type of paint from Testors, Humbrol, Gunze and Xtracrylics. This is a magnificent sheet with superb directions, great color schemes and research. Highly recommended. 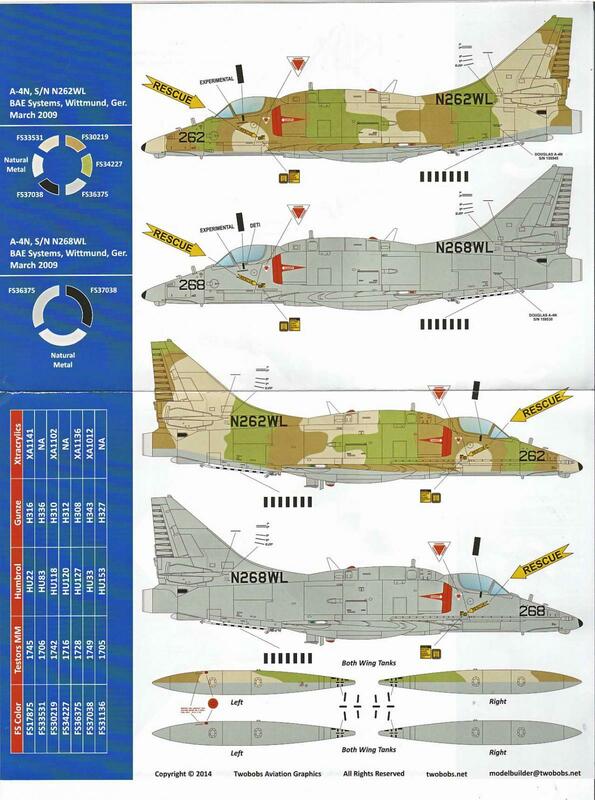 My thanks to TwoBobs and IPMS/USA for the chance to review this item. I need to go dig out my Skyhawk next!